Students and researchers in cognitive sciences and psychology as well as in gerontology, neuropsychology, social psychology, experimental psychology, counseling, education, psycholinguistics, and neurosciences. D.S. Woodruff-Pak, Neural Plasticity as a Substrate for Cognitive Adaptation in Adulthood and Aging. T.R. Bashore, Differential Effects of Aging on the Neurocognitive Functions Subserving Speeded Mental Processing. R. Parasuraman and P.G. Nestor, Preserved Cognitive Operations in Earl Alzheimers Disease. J. Myersonand S. Hale, General Slowing and Age-Invariance in Cognitive Processing: The Other Side of the Coin. S.H. Johnson and J.M. Rybash, A Cognitive Neuroscience Perspective on Age-Related Slowing: Developmental Changes in the Functional Architecture. A. Baron and J. Cerella, Laboratory Tests of the Disuse Account of Cognitive Decline. B. Molander and L. Backman, Performance of a Complex Motor Skill Across the Life-Span: General Trends and Qualifications. L.M. Giambra, Sustained Attention in Older Adults: Performance and Processes. D.J. Madden and D.J. Plude, Selective Preservation of Selective Attention. N.L. Bowles, Semantic Processes that Serve Picture Naming. D.L. Schacter, J.F. Kihlstrom, A.W. Kaszniak, and M. Valdiserri, Preserved and Impaired Memory Functionsin Elderly Adults. 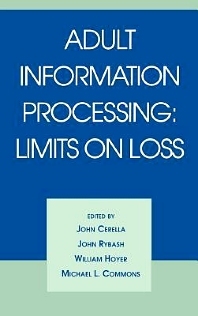 J.C. Bartlett, Limits on Losses in Face Recognition. J.M. Duchek and D.A. Balota, Sparing Activation Processes in Older Adults. R. McGinchey-Berroth and W. Milberg, Preserved Semantic Memory Structure in Alzheimers Disease. P.A. Tun and A. Wingfield, Is Speech Special? Perception and Recall of Spoken Language in Complex Environments. L.L. Light, S.A. Owens, P.G. Mahoney, and D. LaVoie, Comprehension of Metaphors by Young and Older Adults. S. Kemper and C. Anagnopoulos, Adult Use of Discourse Constraints on Syntactic Processing. D.V. Howard and C.L. Wiggs, Aging and Learning: Insights from Implicitand Explicit Tests. E.A. Maylor, Minimized Prospective Memory Loss in Old Age. D.A. Walsh and D.A. Hershey, Mental Models and the Maintenance of Complex Problem-Solving Skills in Old Age. E. Hunt, What Do We Need to Know about Aging? Subject Index.